Why is 3A Sanitary Temperature Measurement Important? Pasteurization Systems: Include high temperature short time (HTST) at 105 degree's celsius and higher heat shorter time (HHST) at 146 degree's celsius requirements. corrosion and scale in boilers and or to facilitate sludge removal for proper boiler care and operation. Sanitation Systems: Include temperature, time and the conventration of specific detergent solutions and bactericides. Cleaning and sanitizing procedures routinely include requirements at 121 degree's celsius. Such factors as flavor control, homogenization, clarification, and seperation of the product are also directly affected by temperature. The	temperature	control	system typically uses an indicating thermometer to measure the process temperature. A second thermometer is used to limit the maximum temperature to a defined preset value. The	temperature	sensors	are installed in a fitting at the outlet of the heating or cooling system with and or without the use of a sanitary flange. These sensors have been mercury column thermometers in the past, but are now being replaced by high accuracy resistance temperature detectors. Pt100 ohm, 385 temperature coefficient in accordance with ASTM E 644, an accuracy of .25 degree's celsius and a temperature range -40 to +200 degree's celsius are the new standard for sanitary thermometers. 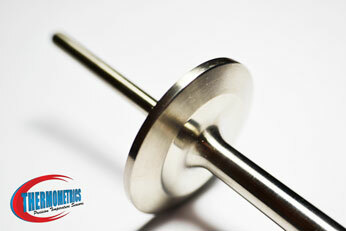 Product contact surfaces are manufactured from 316 stainless steel with a surface finish of 150 grit or better. Non product contact surfaces are manufactured from corrosion resistance material and are smooth, relatively free of pockets and crevices and readily clean-able, non product contact surfaces are shipped prepared for coating.